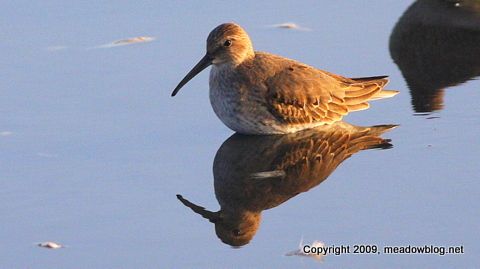 The New Jersey Audubon Society is seeking volunteers for a new Shorebird Survey. Citizen scientists will be asked to count shorebirds at specific sites for at least 15 minutes at least three times a month. To participate, you'll need to attend a shorebird ID workshop on Saturday, Aug. 7, from 10 a.m. to 2 p.m. at DeKorte Park. To register or get more information, e-mail the NJAS' Nellie Tsipoura here. A note from Nellie follows. Chris Takacs reports: Male Kestrel on Disposal Road at DeKorte Park in Lyndhurst Tuesday evening. 1000+ peeps off the Saw Mill Trail, but almost along the 1-E landfill, so too far away to view them. 2 Ospreys, 20 Great Egrets, 15+ snowy Egrets, 6 Black-crowned Night Herons, 2 Laughing Gulls among 200+ gulls which were mostly Ring-billed and Herring. Monday 4:30 a.m. at Clay Ave. Wetland: 2 Virginia Rails vocalizing. 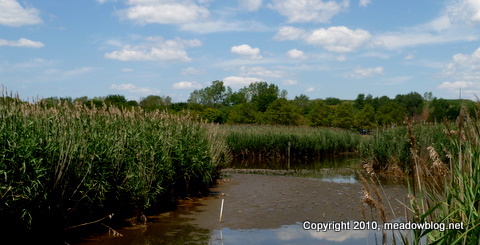 Our next free Marsh Discovery Trail guided walk is at noon on Thursday. Our next free First-Sunday walk is this Sunday at DeKorte Park at 10 a.m. We'll try the marsh Discovery Trail and other hotspots for shorebirds. Our Tuesday MDT walk turned up a few Short-billed Dowitchers, hundreds of Semi-palmated Sandpipers, many Greater and Lesser Yellowlegs, and a few dozen boisterous Forster's Terns. 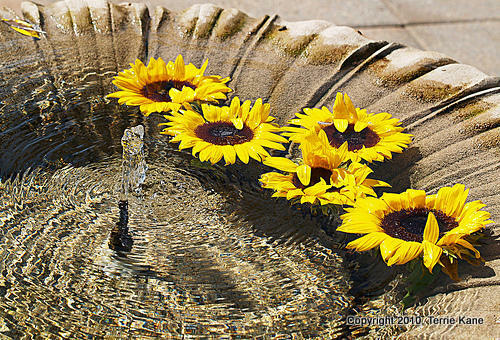 Photographer Terrie Kane took this shot of sunflowers floating in the water fountain at the Jill Ann Ziemkicwicz Butterfly Garden yesterday. 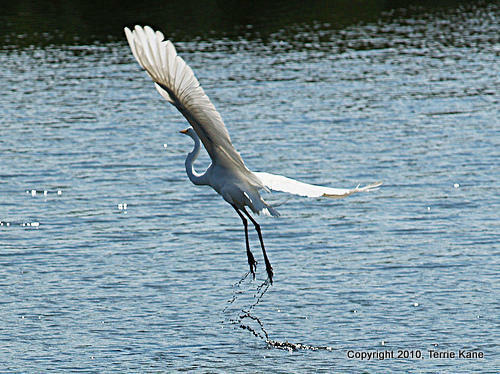 A shot of a Great Egret just after takeoff in the Shorebird Pool is below. You can see more of Terrie's photos from DeKorte Park here.